Mix olive oil, salt, pepper and garlic clove. Place steak in a resealable bag with olive oil mixture. Grill steak in an indoor or outdoor grill at high heat for 4 to 6 minutes on each side or until medium rare. Let cool slightly; slice steak, thinly. Cook green beans as directed on the package; cool slightly. Mash avocadoes with lime juice and salt. To assemble each sandwich: Spread 1 /4 mashed avocado spread inside top of roll. Place 1/2cup packed green beans onto avocado. On the bottom half place 1 slice cheese, tomato slices and 1/ 4 lb sliced meat. Add jalapeño and/or hot sauce, if desired. If Chilean Aji is at hand, substitute for jalapeño and hot sauce. 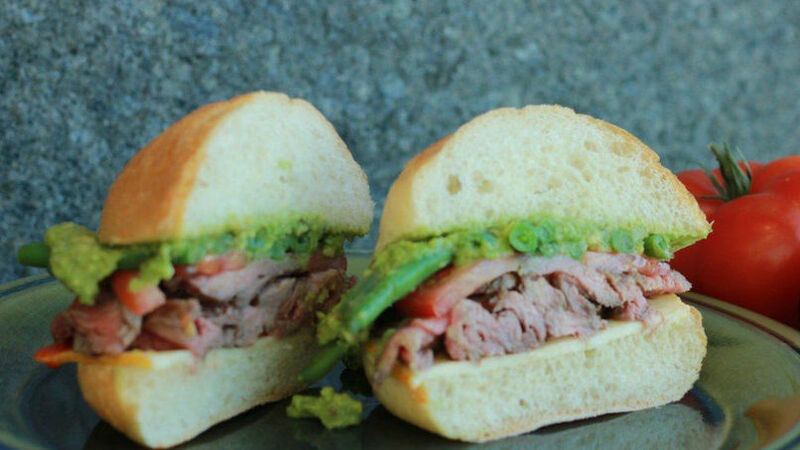 Chacarero it is a fabulous Chilean sandwich made with thinly sliced beef-style steak, on a round roll with tomatoes, green beans, avocado and hot sauce, delicious! It is one of the many varieties of sandwich served in Chilean fuentes de soda, or schoperías and restaurants.